If you are in need of stoker maintenance or repair, you have absolutely come to the right place. Seneca Steel Erectors, Inc. is one of the only companies in the United States that focuses mainly on stokers. We have self-contained mobile workforce teams that we send to your site. We come loaded with the tools, the men and the experience to get your job done rapidly, safely and right. If you need a quote, just pick up the phone and call us right now at 800-853-8225 or send us an electronic quote request. Feel free to spend some time on our site, look around and learn more about our motivated workforce and our capabilities and some of the jobs we have done. 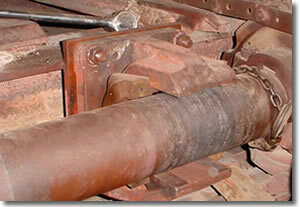 There is a lot more to Seneca Steel than just stoker repair. Preventative maintenance is absolutely critical with stokers, especially when so much is dependent on their continuous operation. Having a specialized company like Seneca Steel to come in for regular inspections will keep you abreast of what is happening within that stoker. A detailed report on the findings is provided and a copy is provided to your stoker representative. The stoker rep will generally give a report as well. These regular reports will help you to make informed decisions to keep the plant operating smoothly. Most of the wear we find in stokers is in the bearings. With the combination of intense heat, constant wear, and sometimes lack of proper lubrication or allowing the stoker to get too hot, they can damage the bars. Not only will we locate and report on any damage, but we will also make maintenance recommendations if we see any areas that may need extra attention. There is no reason that you should have any uncertainty regarding the condition of your stoker. Give us a call at 800-853-8225. Whether it's a scheduled shut-down or an emergency repair, Seneca Steel will work with you to keep your downtime to a minimum. From something as simple as changing a chain to something as difficult as a total stoker rebuild, a Seneca Mobile Team will arrive totally prepared with tools, manpower, and experience. You may need a quick fix until a total plant shutdown can be arranged - the team will work with you and employ the safest options that are available to satisfy your needs. You will get a complete report on what the crew finds and they can help you make the best decisions from their findings. They will stay with you, working round the clock until your stoker is back online. Although we mostly work within the continental United States, we were recently asked to do a stoker rebuild in Hawaii. Here are some details and pictures from that project.